I pretty much called how Day 9 of the Insanity Asylum workout was going to go from the beginning. My knee was hurting a little before I even started Vertical Plyo and I knew it was probably going to act up. Had to wear the knee brace again but it did not do that much for me. There were so many times during the workout that I had to stop the dvd or do a modified move because my knee could not take the impact from jumping or a deep knee bend. Did one legged squats to still do something similar to the move Shaun T wanted us to do. It also did not help that I missed two days prior helping a friend move and ate like crap. Still amazes me how one day of eating not so well can make that much of a difference in your energy level while working out. You can see in a couple of the clips how I struggled with some of the moves. Sometimes my knee feels good and other days it hurts like hell. 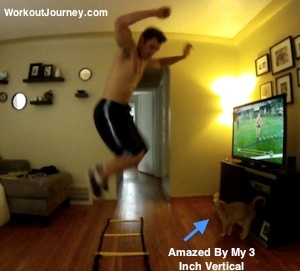 Does your prior injuries deter you from doing the Insanity Asylum Vertical Plyo workout?